Since the 1990s, a burgeoning literature has emerged on the politics and governance of urban climate. It is now evident that urban responses to climate change involve a diverse range of actors as well as forms of agency that cross traditional boundaries, and which have diverse consequences for (dis)empowering different social groups. 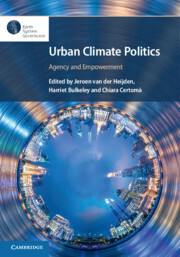 This book provides an overview of the forms of agency in urban climate politics, discussing the friction and power dynamics between them. Written by renowned scholars, it critically assesses the advantages and limitations of increasing agency in urban climate governance. In doing so, it sheds critical new light on the existing literature, advances the state of knowledge of urban climate governance and discusses ways to accelerate urban climate action. With chapters building on case studies from across the world, it is ideal for scholars and practitioners working in the area of urban climate politics and governance.